How do you describe a life of continual illness, pain and profound fatigue? It’s hard, isn’t it? We need empathy, compassion, and maybe someone who lives with the illness to show us. I’d like to be that person for you today. Imagine wanting to be a vibrant, blooming flower for God, but you droop, fade easily, curl up with fatigue. You seek shade, because all bright light hurts your eyes. Sleep is fitful but it’s all you really want to do. So called ‘normal’ life is far too dazzling, hectic and loud for you to join in with for very long. “Yes, I have M.E but it doesn’t have me; God does, and I am safe in His arms.” So runs the last line from a poem I penned to try to describe my life with M.E. Spanning over 25 years of sickness and weakness, M.E might have stolen my health and vitality but it doesn’t get to have the final say on who I am or, more importantly, Whose I am. I’m housebound with M.E, fibromyalgia, arthritis and hypermobility syndrome. (You can see the myriad symptoms of M.E in this list.) I rely heavily on God’s sustaining grace each day. I also have a Lottery winner tendency to spend, spend, spend whenever a little more energy or mental focus is present, instead of the usual resting and pacing after any activity! As a writer and a poet I’m able to express some of the frustrations of living with such an illness. I’m hoping, as you read the poem below, that you might stop to contemplate just what M.E can feel like on this, M.E Awareness Day, part of raised awareness during the month of May. 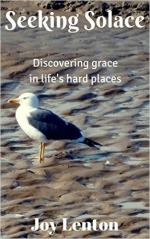 The poem above comes from my book, ‘Seeking Solace: Discovering Grace in Life’s Hard Places’, available on Amazon. Earthbound was actually its working title for a while. All proceeds from every copy sold go to Action for ME, a charity which raises awareness and supports carers and sufferers, while raising funds for research purposes. Last year I wrote about life from the other side of living with M.E and chronic illness, singing my beloved husband’s praises as my carer. It was written before he became even more unwell himself. You can read that post here. Holding close your words today, cherishing the way you love, Joy, despite all. Yes, because He first loved us, which makes all possible. But you choose to love, over and over, often hourly, perhaps even smaller increments at times. If “Hope is the thing with feathers / that perches in the soul / and sings the tune without the words / and never stops at all…: (Thank you, E.D. ), then you, my friend, have a flock roosting within you. You are such an inspiration and encouragement, my friend. I’m sorry that this illness is in your life, but so thankful for the way God uses it and you to bless others. Blessings on your weekend, JOY! pace and balance…and when that doesn’t work, I crawl into my chair, put on a warm robe and blankets, and wait it out. I have mild lupus, but those moments/hours/days are horrible. I can only imagine your pain Joy, but will hold you in prayer. amen and amen! Dear Joy, My heart goes out to you because of all the pain you have to endure. I’m so glad you find beauty and things to smile about. You have certainly brought inspiration and encouragement to me through your poetry, your love and grace that shine through. You really are a blessing! I’m so sorry for what you go through, Joy. I love that however weary your body and spirit are, you know M.E. doesn’t have you. Yes, it’s God who has us, and we are safe in His arms! Love and hugs to you!